Poly-Tek is a rubber track pad manufacturer. 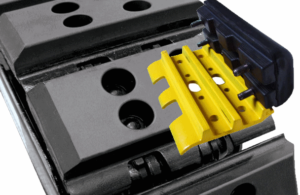 We produce rubber track pads for a range of applications within the Construction Industry. We manufacture and sell rubber track pads for dozers and excavators. All styles of track pads including clamp on rubber track pads, bolt on rubber track pads, polyurethane track pads, urethane track pads, clip on rubber track pads, trackpad rubber feet. As custom molders, we specialize in creating track pads specifically tailored toward your needed application. Enter your email address, and we will contact you about receiving free samples!!! Copyright © 2019 Poly Tek, Inc. Contact Poly-Tek today for all your custom molding needs!